T�inec is a city with 40.000 inhabitants. The first trace of the present parts of T�inec (Guty, Ko�sk�, Doln� Li�n�, Horn� Li�n�) dated back to the beginning of the 14th century. The first written trace of T�inec itself dated back to 1444. People in that region had worked in farming and weaving until 1839, when iron works were put into operation. Fast development of metallurgy speeded up development of the town. In 1931 T�inec was advanced to town. The central emblem refers to the city's iron works. A settlement proved already in 1444, town status in 1931. T�inec councillors used on seals and stamps an old sign (a tree with two clasped hands in front). 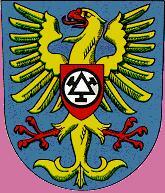 Just since April 1968 discussions about Coat of Arms on local National Louncil has begun. The "plenum" of MestNV adopted in May 14, 1969 a proposal by Ji�i Louda. Azure a T��n Eagle Or armed and langued Gules. It has a gothical escutcheon Gules on breast, charged with white ball, bordered sable, in it a triangle voided of the same, from its sides are three hammers of different shapes rising (it is sign or emblem of Trinecke zelezarny, Trinec Iron Works). The symbol is logo of the Trinec Iron and Steel Works (see attachment). On this website is a picture of the symbol, but the design of hammers (�el�zek, irons) is slightly diferent from the logo on www.trz.cz.